A OnePass account is a username and password that can be used across multiple Thomson Reuters websites and services including Westlaw, My Account and many more. 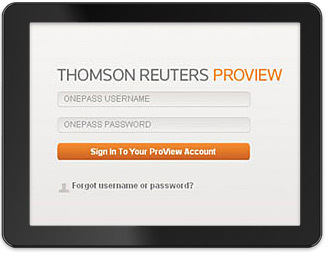 To access your eBooks on Thomson Reuters ProView, they must be linked to a OnePass account. If you purchased an eBook via the Sweet & Maxwell website, you already have a OnePass account. It will automatically be linked to your OnePass account. You can skip this section and go to Step 2. You will be sent a registration email when your eBook is published with full instructions on how to link it to your OnePass account. You only need to do this for your first order, all future eBook purchases will automatically be linked to your OnePass account. You can skip the remainder of this section and go to Step 2. If you have previously registered an eBook, you will already have a OnePass account and your eBook will have been automatically linked to it. You can skip the remainder of this section and go to Step 2. If you did not purchase your eBook from the Sweet & Maxwell website, click here to register for OnePass or update an existing OnePass account with details of your eBook. After entering/updating your personal details, in the Products section, select ProView from the Manage Products page/button then click Add. Type in the two part Registration Key from your registration email and click Continue. Click Create/Update Account to save the changes to your OnePass account and close your browser. If you have already downloaded the free Thomson Reuters ProView app, skip this section and go to Step 3. If you do not have the ProView app, please download it. Log in with your OnePass username and password. Note: if your first eBook has not yet been published, you cannot log in until you receive your registration email upon publication. If your eBook has been published, it will be ready for you in your library. View the User Guide (PDF) and follow instructions or you can watch our video.